Texprocess 2017 - Amann Group: Thinking solutions! Amann’s textile think-tank develops intelligent products, individual solutions and innovative concepts for textile issues. Not only for sewing and embroidery threads but also for textile surfaces! 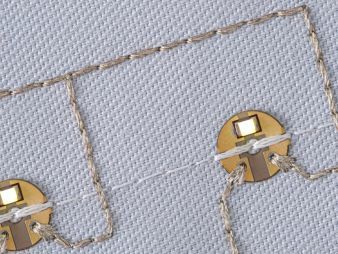 The entire spectrum includes conductive threads and yarns, hybrid threads for composites, sensor yarns, threads with indicator function as well as a multitude of functional yarns and technical threads. Following its claim “thinking solutions”, Amann Innovation Lab develops solutions for tomorrow’s market requirements. For more than 160 years, Amann has been one of the global leaders in the field of high-quality sewing and embroidery threads. In close cooperation with the customers, Amann develops sewing and embroidery threads as well as functional yarns and technical threads for tomorrow’s market requirements. The Amann Innovation Lab, Amann’s newly founded innovation pool, was specifically created for this purpose. At this year’s Techtextil, the focus will be on Amann’s new R&D centre, the Amann Innovation Lab. At the Amann booth, all visitors are welcome to experience what the Amann Innovation Lab does and how it can help customers in finding innovative sustainable solutions. The work methods will be presented – from the fundamental concept, to the serial transfer – with an eye to product and process performance, as well as cost efficiency.